about Jose Moreno; Born into a family of famous flamenco artists Estrella Morena (dancer) and Pepe de Málaga (singer), Jose began his flamenco career at an early age. His debut was at the famous Tablao Costa Vasca in Miami. Jose continued his studies with the Great Manolete, Farruquito, and Andres Marin and Cajon Percussion with Manuel Soler. Jose has been invited to perform in various companies, and worked with distinguished artists such as: The Great Manolete, Joaquin Ruiz, Pastora Galvan, Jose Cortes “Pansequito”, Jose Luis Rodriquez, Roberto Castellon, Pedro Cortes, Jose Valle “Chuscales”, Basilio Garcia, Paco Heredia, Elena Andujar, Jesus Montoya, Zorongo Flamenco Dance, La Tania, Miguel Vargas, Nelida Tirado, Antonio Hidalgo, Curro Cueto, Ruben de Maria, Gonzalo Grau, Edwin Aparicio, Amparo Heredia, Antonio Granjero and Omayra Amaya. In 2001, Jose choreographed and performed a collaborative work with his mother Estrella Morena, and with renowned flamenco singer Carmen Linares with the New World Symphony Orquestra at Lincoln Theater in Miami. In 2007, Jose performed with the internationally known Isabel Pantoja as a cajón percussionist, alongside flamenco guitarist Jose de Luna, in 2007 with David Bisbal in “Premios lo Nuestro” and also performed in 2010 in the 7th annual Panama Jazz Festival and Carnegie Hall in New York City. Seattle-based Flamenco dancer, Savannah Fuentes brings her latest show, Luz - an evening of Flamenco, to Calistoga, performing at the Calistoga Art Center. Savannah Fuentes, born in Seattle to parents of Puerto Rican and Irish ancestry, is one of the only touring artists in the Pacific Northwest region with strong links to Flamenco culture. She studies both baile (flamenco dance) and cante (flamenco singing) and has toured throughout the states of Washington, Oregon, California, Nevada, Utah, Montana, Idaho and Arizona. She has independently produced over 250 performances and workshops featuring internationally recognized Spanish Flamenco Artists such as Jose Anillo, Saray Munoz, Jesus Montoya, and Juanarito. She has studied with artists such as Guadiana, Joaquin Grilo, Eva Yerbabuena, El Farru, and Isabel Bayon. She attributes her formation as an artist to her most significant mentor, Maestra Sara de Luis. She continues to evolve as an innovator and performance artist. Savannah will be joined by two exceptional Spanish Flamenco artists; acclaimed Spanish-Romani guitarist Pedro Cortes and singer/percussionist/dancer Jose Moreno. See below for information on them. 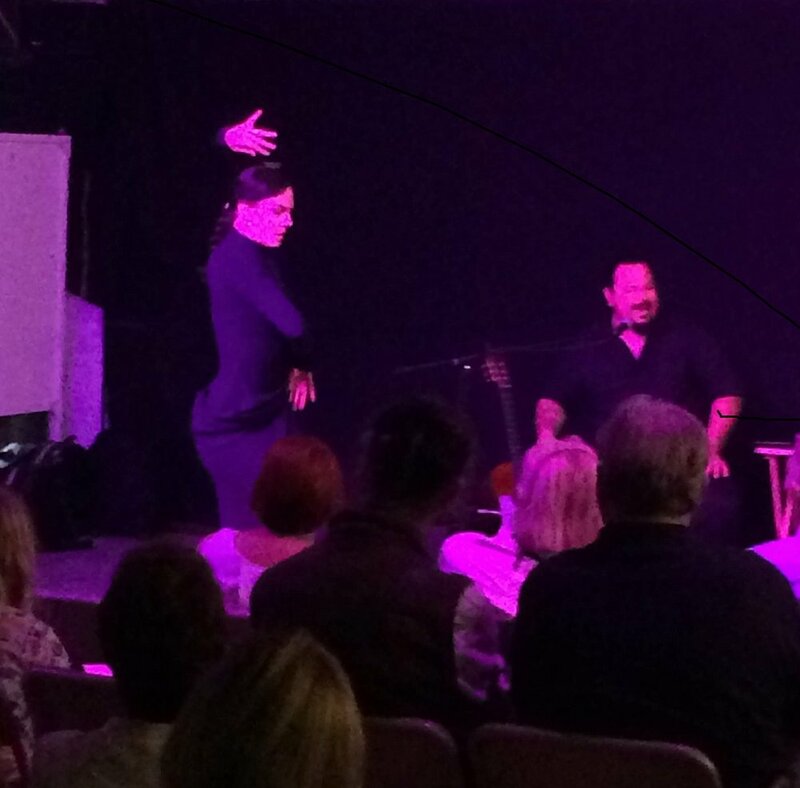 Luz, an evening of Flamenco will be presented in select locations in Washington, Oregon, California, Nevada, Utah, and Colorado. Come experience the art and grace and passion of Flamenco. "Real flamenco. straight up and stunning" -Regina Hackett, The Seattle P.I. about Pedro Cortes; Pedro Cortes, Comes from a family of Spanish Gypsy guitarists and began his studies with his father and the esteemed Flamenco guitarist Sabicas. Having toured professionally since the age of 17, he is gaining international recognition as a soloist and composer. He has premiered his work En la oscuridad de las minas at the Teatro Albeniz in Madrid, he had works premiered by the Carlota Santana Spanish Dance Company at the Joyce Theater in New York. He has two books on Flamenco, El Dron del Faraon and Cruzando el Charco, published by the American Institute of Guitar. Mr. Cortes, was commissioned by the Cohen Brothers to compose music for the film Paris Je T’Aime. He also wrote music for a childrens program on HBO called Fairy tale for Every Child. He has toured with Jose Greco and Maria Benitez, La Conja and has performed with such artists as Farrucita, La Tati, Merche Esmeralda, Manolete and the late Lola Flores. He has been guest artist with the St. Louis Opera and the New York Grand Opera, and has been commissioned by and performed as Musical Director with the Guthrie Theater In Garcia Lorcas BODAS DE SANGRE. Mr. Cortes is artistic director of his own Flamenco group and also Musical Director of Palo Seco. Cortes is a third generation Flamenco guitarists and uses the experience passed down to him by his family to maintain the purity of Flamenco while creating new compositions.